Just wrapped up a project for our local Big Brothers and Big Sisters organization. A worthy cause for sure. Dad took the kids bowling over at Sun Mountain Fun Center a couple of weeks ago – which was a great opportunity to set up an impromptu photo shoot. 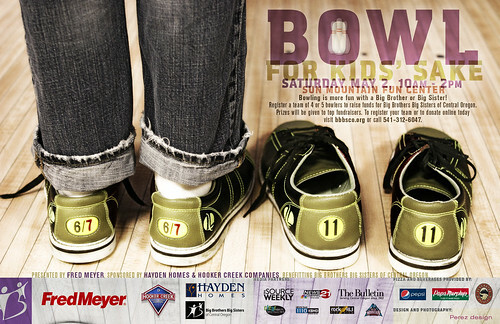 The event is “Bowl for Kid’s Sake” so a photo of kids in a bowling alley was one of my first thoughts – and from there came the idea for the poster. The final image I chose was of Max standing next to a pair of empty adult shoes. I suppose a number of headlines could have been used for that image but my thoughts went to “Bowling is more fun with a big brother or big sister”. I can’t remember ever going bowling by myself. It’s been a while since my last post – yikes. Been really busy and will be posting more stuff for sure.